In this previous blog we examined the first large Russian invasion into Ukraine, that happened at Dibrivka (East of Marinovka) which was prelude to the other better known large scale invasion at Ilovaisk. Still there are a lot of questions about this invasion, such as: where did all these vehicles go and what did they do? It most likely had something to do with the Krasnyi Luch disaster. So here is a further investigation into what had been going on there. Determining how far the Ukrainians had come. And that's it. These maps never show Ukraine anywhere closer to Krasnyi Luch. But these maps are not really reliable. They for instance never show Ukrainian forces anywhere near Izvarino either, while there is a very clear destroyed/abandoned Ukrainian camp there. Furthermore such maps always lag several days behind the actual events, since it takes time for information to show up and HQs don't want to let you know what they are doing in real time. So there is a need to more precisely know the maximum extend to where the Ukrainians had come and how exactly the Russians defeated them. A combination of open sources can be uses to determine this. lostarmour.info gives geotagged info on where wrecks from the war can be found. If a Ukrainian wreck is somewhere, it means the Ukrainians have been there. Satellite images help to see where camps, positions, tracks and wrecks are or where fighting or shelling took place. Impact craters can be used to determine the direction and thus who likely shot them and that in turn may help to determine who created the tracks. Geolocated videos helps to determine areas of operation and identify better who shot the shells and who had been driving where. Also this helps to determine dates and timeframes, since videos can not have been recorded after their uploaddate. In case of doubt, wrecks will be assigned as Ukrainian. Russian( proxie)s use Ukrainian markings on their vehicles too. Russian armour that has been damaged is being removed as quickly as possible from the battlefield and therefore remains unrecorded. Russian militias made a lot of use of civilian cars. A LOT of civilian cars like that were destroyed. See this blog for instance. There is NOT A SINGLE ONE in the LostArmour database. Because of this, the database mainly has Ukrainian wrecks and very little Russian ones. On the other hand most of the Ukrainian vehicles were destroyed by (cross-border) Russian artillery fire, and thus a lot more Ukrainian armour was destroyed than Russian. If vehicles are said to be (pro)Russian, there is no denying they are. If assigned Ukrainian, double check if they are. There is always a chance they just say so. A (very) large percentage of (pro)Russian wrecks will not be recorded. Since the database gives references to sources, it is also a good starting point to find videos about the events. Up to the Northern part of Krasnyi Luch Ukrainian wrecks can be found as well as Russian. The red lines are unique tracks not on roads, seen on the satellite image of Sept 4th and not seen on the previous image (2013). The purple areas contain impact craters from artillery, with the yellow lines indicating some of the directions. Most of it comes from Russian side, some from Ukrainian. The very small white areas are houses being damaged, indicating there was heavy fighting there. The orange area top right shows lot of tracks, indicating armor had been moving back and forth there. Probably this was a position for a Russian tank. The green line indicates how far the Ukrainians did come at least. There are two white vans (red squares; not in LostArmour) and two Kamaz 5350 (orange squares). See Lostarmour #1 Lostarmour #2. A small Russian convoy got seriously hit here. The red circle shows the blast and burn marks on the street. On the left bottom side in the circle there is a wreck. LA does not show this wreck and none of the videos in the area show it either. This might very well be another Russian vehicle conveniently omitted for propaganda services. Did the Ukrainians come any further? This video claims to have been recorded on the road (M3) from Debaltseve to Krasny Luch or even Antratsyt, but it can not be geolocated anywhere on it. If this would be true, Krasny Luch would have been completely encircled and cut of at one moment, but for now there are no hard indications this had really happened. Even though there was damage on nearby buildings it had largely missed the blockpost. It is possible... with the cossacks fleeing, their blockpost might not show signs of battle. The area between Krasnyi Luch and Lutuhyne is largely nomansland, uncontested or... empty, so easy to travel through without trouble. But this was 'leaving the area' and not 'liberating it'. Since most of the details in that article matches with our findings here, it seems to be correct. Black line = the border with Russia. Red tracks = the two main routes of the Russian Dmytrivka-Dibrivka invasion. Green line = the border as how far the Ukrainians did get based on evidence found. Dotted green line = likely the Ukrainians got a bit further in these areas as well. So in this area about 3 times as much wrecks were found as in LA, (with passenger cars not even included). It still remains a big question especially what the identity is of the wrecks visible on Google Earth. thin red lines = unique tracks of one or maybe some more vehicles. The yellow area shows multiple unique tracks (besides the normal roads) leading from Stepanivka/Marinovka to the road North of Dmitrivka and to Krasnyi Luch. Clearly the Ukrainian attack has been taking place along these routes although some of course also might/must have been used by the Russians chasing the retreating Ukrainians. Did a Russian invasion attack take place along this route to flank the Ukrainians that went to Krasnyi Luch? Or was it a Ukrainian attack adding to the advance that came from Stepanivka? Or was it even something different? Tracks leading in and out of the treelines are almost certainly from military camps. But besides that, a lot of activity seemed to have been going on too. The big question is: was it a Russian camp or a Ukrainian? And thus, was it part of the Ukrainian advance, or part of the Russian invasion? And related to this question: was Dmytrivka taken back by the Ukrainians (for a very short period) in the Krasny Luch operation or has it always stayed under Russian control? In order to determine what had happened, we can make a timeline of geolocated videos from that period and draw them on the map accordingly, with an appropriate adjusted frontline. 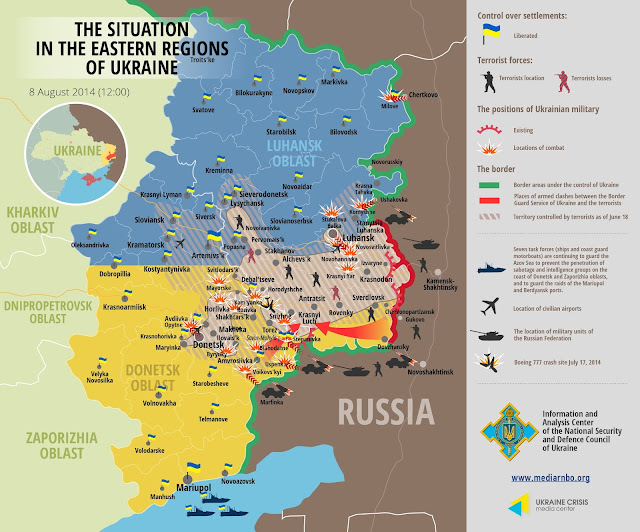 Our start map is from the beginning of July when the Ukrainian army had almost reached Izvaryne. So far no videos have been found showing/proving the Ukrainian army got any further than this. There are Ukrainian positions visible near Semenivske and Tarany. Stepanivka was not taken at that time, Marynivka was in Ukrainian control, but Dmytrivka was not (there was a now deleted video of Aleksander Ivin on July 3rd near Dmytrivka). Substantial Ukrainian forces were located NorthEast of Dibrivka. As can be seen there is a dangerous narrow path at the location of Chervona Zorya. What makes that area even more difficult, is that a small river runs north-south at the point which needs to be crossed to get to the border area Eastwards. 7-7 the first crossing-border GRAD attack near Biryukove. 7-7 Dolzhansky border crossing is in Russian control. To summarize this: heavy and intense artillery from Russian side that destroyed some Ukrainian camps. With Marinovka being taken, there is not even a hard road connecting the border area. Big risk of getting completely cut off. One might even argue that the downing of MH17 was to distract from the many cross-border shellings. 18-7 Attacks from Dmytrivka in direction of Kozhevnya. 24-7 Ukrainian positions south of Marinovka taken. 25-7 Marinovka Border crossing taken by Russians. The border units are firmly cut off at Marinovka. The Dyakove units still hold ground and seem rather untouched so far. There may be remnants of other units still along the border, but they hardly 'control' anything. They just try to survive the continuous shelling from Russian side which they cannot counter and they are on the retreat. Ukrainian units drove all the way from Debaltseve to Hirne and then to Petrivske. They must have arrived near Petrivske at July 28th. Saur Mogila was reported to be taken (but only briefly) and Stepanivka was captured on July 29th. So it seems the attack on Stepanivka came from the direction of Petrivske. Their colleagues also coming from the north, entered the outskirts of Shakhtarsk in the East. Now the pressure is on, on the Dyakove camps. A convoy including an ammunition truck got completely destroyed. The next day on July 29th some other units got a deadly surprise very close to the Russian border. They discovered the hard way that they were completely cut off. Some Ukrainians were captured and tortured by Aleksander Ivin's team. Meanwhile their camps are heavily shelled as satellite images show. 4-8 About all border camps are destroyed and abandoned, except for the ones near Dyakove. Ukrainians advance towards Krasny Luch WHILE the border units escape from the border zone traveling North around Dmytrivka. This can be understood from the (geolocated) videos from Vitek Nikolaevskij. (We'll have a detailed look at those in a separate upcoming blog, since they are essential in understanding what had happened.) From thess we'll also understand that the green areas had been used by Russia to shell the (retreating) Ukrainian units (yellow arrow). Almost immediately after the advance there is already a deadly counterattack on the checkpoint near Pervomaiskyi. Since the escaping border units had to travel around Dmytrivka, we can safely conclude that Dmytrivka was not taken by Ukraine in the Krasnyi Luch operation. With Ukraine's border units destroyed, a new phase comes into play: Russia no longer can just attack with artillery from it's own territory and will need to massively invade Ukraine. The steady but limited supply of armor so far, is not enough to turn the Ukrainian upcoming tide. To cover up for this Putin had invented the White Truck Charade which kept Western journalists busy for days. The counterattack first and mostly comes from Dmytrivka area to cut of the Ukrainian units that went to Miusynsk and Krasny Luch. The supply route for this was the Dibrivka route. Motorola's team joined in from the other side, especially to produce videos and to make it look like 'a handful of rebels destroyed the Ukrainian army'. The long video above shows that the entire Krasny Luch area was cleared by that day. The operation had started on the 5th of August. By the 12th it had already been firmly cut off. It lasted 1 to maximum two weeks and came at a tremendous cost in armour. It's hard to say exactly how many Ukrainians died in this operation. It's only success basically was that the border units were able to escape. Since the first image after 2013 dates from February 2015 it is hard to tell exactly when this road was created and whether it was used for the Krasnyi Luch operation or not. Without a budget for buying expensive satellite images, we can still use the previews to determine the date :-), since this road is large enough to show up on a preview. Apollomapping.com has one of the best user interfaces for searching satellite images. Therefore we must conclude that this second route had nothing to do with the Krasny Luch operation. And neither with the Ilovaisk invasion, which had happened at the end of August. It must have served as one of the supply routes from Russia - Dibrivka - Dmytrivka - Snizhne for the next Debaltseve offensive. The main effect of the Ukrainian Krasnyi Luch operation was that a lot of border units managed to escape from their trap. As such, one could call it a success. It came at a very high cost, but abandoning the trapped border units would have been much worse. But freeing the border units does not seem to have been the single goal. Ukraine brought heavy artillery into the area and they did try to cut off the Krasny Luch road. They must have been in a state of euphoria because of the successful progress in the Debaltseve area, that made them decide to push on beyond what could be considered wise. It must be considered a tactical and strategical error of the Ukrainian army that they had never taken Dmytrivka. They must have been able to relatively easily do this when they traveled along the border in June. They had substantial forces at that moment. Why have all of them depend on a supply line close to Russia's border consisting of two pontoon bridges? Had they liberated Dmytrivka, they would have had a much more solid base to supply them. Marinovka would not have been as vulnerable as it turned out it was. And in the Krasnyi Luch operation... why did they not take Dmytrivka first? Why spread out all your forces to cut off a distant road, while you know the backdoor is open? Now Dmytrivka served as the base to cut off the Krasnyi Luch/Miusynsk units. Ukraine would not have won the war with taking Dmytrivka. Like with Lugansk Airport and Debaltseve, the Russians would have taken it anyways. But it would have been much more difficult and at a much higher cost for them. Also see: Ukrainian language report on the initial capture of Kozhevnya. New position seems to be under construction 47.894987°, 38.350338° near Pokrovka. Ukrainian Roadblock 47.816606°, 38.605183° between Amvrosiivka and Semenivske. Ukrainian Roadblock 47.713569°, 38.502269° south of Amvrosiivka at Mokrojelanchyk. Ukrainian Roadblock 47.675643°, 38.402645° near Novoivanivka. Ukrainian Roadblock 47.795011°, 38.201950° near Osykove. They really round out the control of the area around Amvrosiivka at that time. Great additions! Only the first one (47.894987°, 38.350338°) I am not sure about, because it seems to be facing southward and impact craters in the neighbourhood seem to have come from Ukrainian side.